I have but that cable is damn spensive! I have to say, my initial experience with a USB DAC in a near field system offered noticeable improvement over networked Squeezebox player with digital coax. Imaging, specifically, and the experience felt more immersive and surrounding. 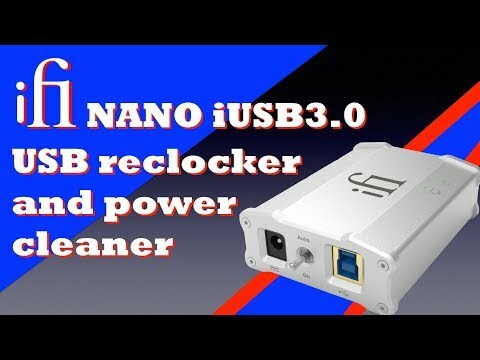 Seems worth exploring USB power isolation and noise reduction. I'll have to see whether the USB DACs mention anything in their documentation about noise suppression. 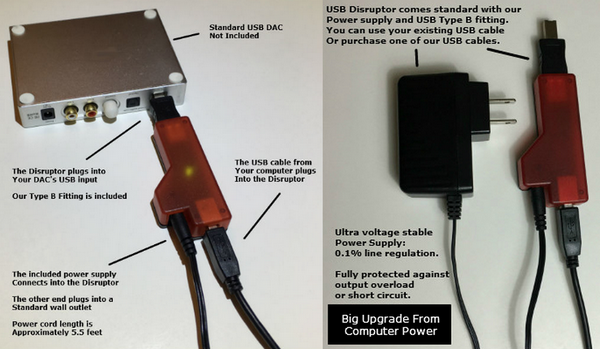 This version of a USB Disruptor is the cheaper version of an isolation approach without iFi's additional tech. They apparently offer a separate USB cable that has the power and metal connectivity disabled for isolation. This no frills design is for those who wouldn't be partial to a particular USB cable. Reviews indicate the USBD offered greater improvement than any single USB cable upgrade the reviewers had tried. @msg Scott I have an ifi nano idsd and two ifi micro idsd's and I remember reading somewhere that one the other or both had their noise suppresion built in, however, when I asked them at ifi about the ipurifier 2 they said it would be an improvement when used with the idsd's. I would ask about that grand slam but I don't see myself buying that cable any time soon. Oh and Hans likes their wall warts. I should have a chance to try it out this weekend before or after I'm bending over for taxes. Well, I'm still on the fence. Somebody going to give me a push? @clipdat is on a vigil. He's watching the Monoprice amp with full attention in case it spontaneously combusts! Stay strong Drew! ... or gettin' high huffing the fumes. Not that those two pastimes are mutually exclusive, mind you. Wasn't in the cards this weekend. Hopefully soon. lol @machone it's not that easy when your computer setup shares a room with your TV loving wife. Guess who gets priority on sound? My 2 channel rig is relegated to the bedroom! If it was up to me I wouldn't even have a TV in the house, and my 2 channel system would be where the TV currently is. Putting on an album and listening to it from start to finish should be it's own form of entertainment. Or even just putting some tunes on in the background and *gasp* having a face to face conversation. Get that women a TV in the kitchen! That's not a kitchen but that apron's hot! Does the iPurifier2 require a break in process? I would think any electronic piece would benefit from burn-in time. Noted. I observed that it does get warm during use, so yeah maybe it needs some time to settle in. I "installed" it last night, but I'm going to wait to make a judgement on it until I get some more time spent listening with it in the signal chain. Then, I'll try going back to how it was without it and see what I notice. oops, not enough coffee yet. So I've had it installed for about a week and I've been using it. Decided to test it tonight. I just listened to 4 tracks with it, and then removed it and listened to the same 4 tracks. I'm not really detecting any discernible differences. If anything I prefer the sound without it installed. Shrug! YMMV. Probly been asked but what is your setup? I am all about lowering noise floor but adding to the signal chain is at the same time counter intuitive. Tonight it was FLACs -> Audioquest Forest 1.5m -> [ifi iPurifier2] -> Topping D10 -> Polk Blackstone TL3 satellite speakers on 60wpc and dual 6.5" driver ported subwoofer getting 160w.